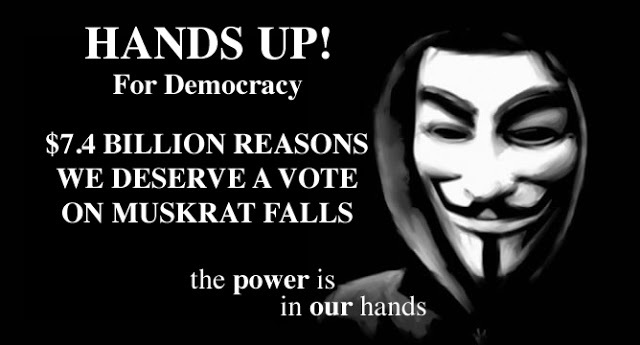 The news late yesterday evening that the Progressive Conservative Party would rather cancel a proposed special debate on the proposed Muskrat Falls Hydro Development rolled out like a thunder storm yesterday. So much for the Proud and Determined Newfoundlander and Labradorian. This government thinks it can take you for granted. The Minister of Justice and current Government House Leader has seriously miscalculated the mood of the province. I am now convinced that the government was never sincere on a debate. It took the urging of former Energy Minister Shawn Skinner’s public call for a debate to force the Dunderdale Government to agree to a special debate. Up to that point they had said thee was no need for it. It looks like the government is playing with the public and the opposition like a kitten with a ball of yarn. The problem is that this ball of yarn is worth $10 Billion. This type of manipulation, arrogance and pigheadedness is hard to accept! Frankly, a non-binding debate in the House of Assembly was a little cowardly. If the puppets in the PC. Caucus endorse this deal, why will they not stand up in the House of Assembly and sanction it? If this deal is so good, and it might be, why is Nalcor and the Progressive Conservatives afraid to give the public an opportunity to endorse it via a plebiscite? Why do the Progressive Conservatives think the public are too stupid to consult? Why are we are not allowed to sign this cheque for $10 Billion of our money? It is becoming clear that this is a done deal. There is nothing we can do to influence the outcome. Or is there? Are we mice or men? Are we self defeatist? If enough people oppose the project and show concern by marching, protesting and doing sit-ins the government will have no choice but to listen. Giving up is akin to abandoning democracy. I am Proud and Determined Newfoundlander and Labradorian? Peter, I'm with you in spirit but spend way too much time in Alberta to get involved in planning a protest. However, I would be more than willing to march and do whatever it takes to get there. If it means a financial contribution or something of that nature count me in. Some people are talking about how they are "sick and tired" of hearing about Muskrat Falls but I am sick at the thought of how unmotivated and apathetic too many of our fellow citizens are. No wonder these incompetents are so willing to ram this down our throats. As you say, Peter, it is time for us to stand up to them! !